Web advertising is one of the fastest growing revenue generating media around. Datatrax® provides a single entry, integrated database with advanced Browser Based functionality that makes sharing data easy. Whether your work groups are sharing data across the room or around the world, Datatrax® has the tools to keep everyone informed. 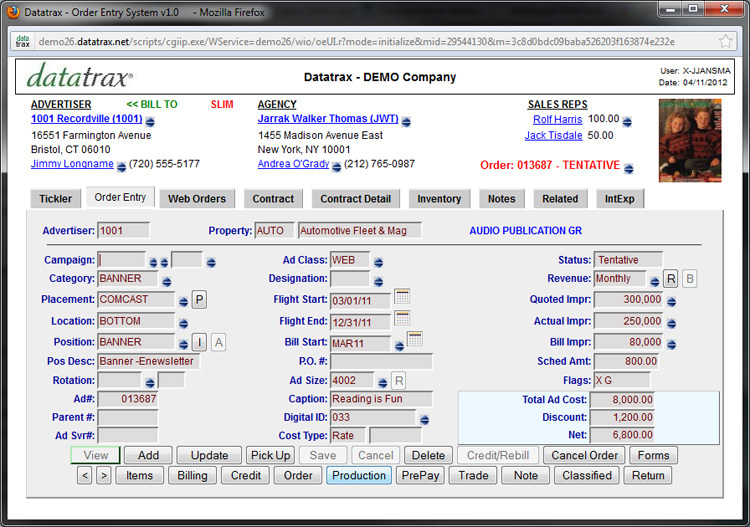 Datatrax® organizes and displays all pertinent data for quick entry and analysis: Contacts for both Advertisers and Agencies, Advertiser/Agency billing relationships, Advertisers' WEB Ad schedules, Deferred and Recognized Revenue, A/R and Credit History, WEB Ad Order splits between more than one sales representative and Ticklers/Reminders to facilitate Order Fulfillment through CRM (Customer Relationship Management) - to name a few. Datatrax® also tracks the revenue side of the business. Datatrax® can auto-create the General Ledger transactions recognizing monthly revenue and recording the off-set to deferred revenue (debit and offsetting credit). These transactions can be imported from the viewable G/L export file, or you can decide which elements you wish to "pull" from the G/L Table. Revenue can be calculated for monthly recognition, one-time recognition or recognized based on number of days and reported monthly. 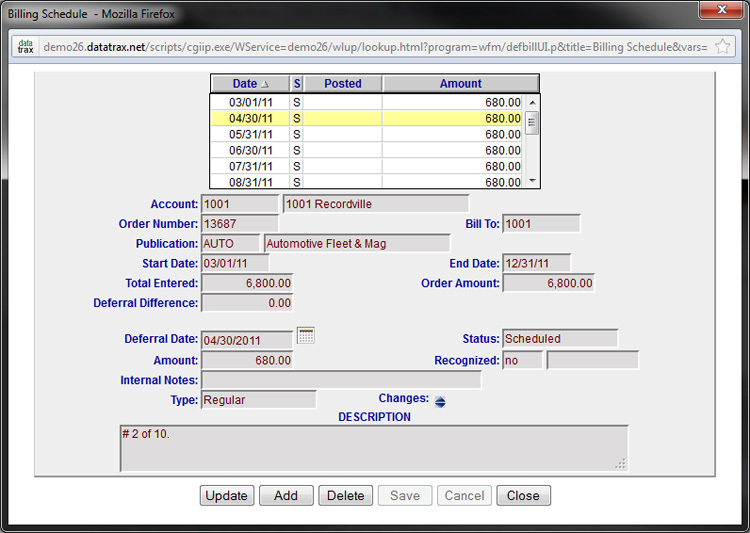 Datatrax® integrates Sales, Production, Fulfillment, E-commerce, and Accounting. One Unified database to collect and analyze your evolving data. Datatrax® has hundreds of satisfied users managing over a thousand publications. Our Customer Support Department answers better than 96% of all incoming support calls, live, during normal working hours, as they come in, and by a trained Datatrax® support professional. Datatrax® is scalable from a single user stand-alone system to publishing companies with over 250 simultaneous users.